Or do you Google “best damn protective gear evarrr” and whip out the debit card? Most of us will probably choose the latter, but why do some go beyond bargain hunting and try to buy the cheapest gear available for kit up purposes? Why are we putting our safety and the hinging success of numerous American-based tactical companies at risk? Why are we killing ourselves and the tactical/adventure companies of America? Maybe we simply don’t realize it. We’re all focusing on our budgets and making sure we can afford everything we want; but do we actually step back and ask what pieces of kit are essential, what pieces are pure Gucci-gear, and what are we actually spending our money on? If you work for a living you want your dollar to go far, you want to buy quality and promote good business, but if you’ve ever bought a knock-off product (see also: Condor) then you’re doing exactly opposite. If you had to buy a pacemaker would you buy the best you could possibly afford, or would you buy some pace-o-matic from a design-stealing firm overseas that pays below-ethical wages and changes between making pacemakers and carburetors each production shift? If you said the latter then stop reading now, you don’t belong in this article or in the group of people reading it that recognize the conscious power they have when they spend their money (you would probably feel more comfortable with the group of people who spent their “stimulus” check on overseas goods; see also: Bad Idea). Now that you’ve been guilt-tripped into buying quality kit it’s time you get the high from owning top quality gear in the form of “what’s the difference,” a method to determine what really works for you along with a list of resources you can use to make the best decisions to fit your requirements, and the names of places I recommend you patron and the names of places I recommend you steer far away from. Built-in Quality — as a degreed engineer I’ve been abused in the ways of manufacturing processes and even developed somewhat of a fetish for rooting out what makes a product quality. I know the difference of acid etching a product before it’s fluorescent penetrant dipped for surface crack detection. 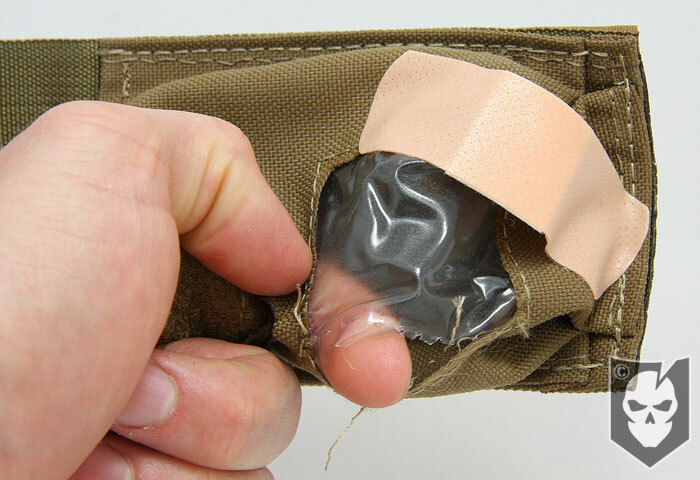 The devilish details that a manufacturer uses when making kit will save your life. This is as true for bartacked nylon stitching as much as it is for staked gas rings and stress-relieved metal components. Know how the manufacturer designs and makes your gear. If it’s in a sweatshop that makes tablecloths for Target one day and plate carriers the next day then skip it — quality comes from dedication. Skilled and dedicated workers will produce better gear than a seamstress who really enjoys making napkins, but for her $0.30/day she’ll begrudgingly make chest rigs, too. Research, Development, and Innovation — the frontline companies who unroll the new designs do it because they put money, thought, and technology into their products and reap the rewards of innovation. If you’ve been paying attention, Propper has just expanded their team by hiring some of the best in the adventure clothing and textile business. Why? Because they care about the people who use their stuff more than they care about pure profit. You think the knockoff companies care about saving your hide? No, they don’t. Sorry if that’s a spoiler alert for some of you but it’s the plain truth. The company that just sent you the $14 tactical MulitCam pant doesn’t care if it fails you in the field (which it will). Conversely, the company who just delivered you a $50+ dollar tactical pant does care about your ability to function — that’s why they’ve researched the gusseted crotch, that’s why they made sure to use plastic hardware that isn’t IR hot, and that’s why when you call them you get to speak to someone who understands your need and whose ultimate goal is to get you what you need — not to get to the next call in as short a time as possible. Care and Economy — this point will be saved for the end of the article but I want you to be very aware that this aspect is hugely important. Research and action are the two things you need to be successful in acquisition as far as this article is concerned. First thing you should do when you’re in the market for new gear is to identify your no-kidding requirements. You may also call these needs, it doesn’t matter, just make a list of objective performance measures that the chosen product must hit. This can be a certain color, a certain carrying capacity, a certain blade length, a certain compatibility with other gear, whatever, just list it out. Seriously, write it down. Next is the always-fun current product research. It’s unlikely you will have such a need that you contract out an independent or custom gear maker to get you what you need (but if you do, don’t settle for anything less, do it what it takes to get what you need). Thanks to Al Gore’s internet you can find out nearly (if not literally) everything you need to know about almost anything just by logging on to the world wide timewaster, I mean, web. Sounds like I’m speaking engrish, right? Google’s query engines are smart enough to pick out the meat of what you want from the internet’s information ocean so don’t worry about sounding third-world English or a little under the influence, just make sure you query your needs. Compile all the good info on all the products that appear to meet your needs and then get ready to make a decision matrix. Sounds like a lot of work but it’s actually resource light and will keep you from making decisions based on subjectivity instead of facts and data. Your brain is programmed to NOT do decision matrices. You read that right, the human brain is actively designed not to do that. Instead your brain wants to use pre-determined neural patterns to influence your decision; it does NOT want to list out positives, negatives, and mitigations. So we have to beat it. How? 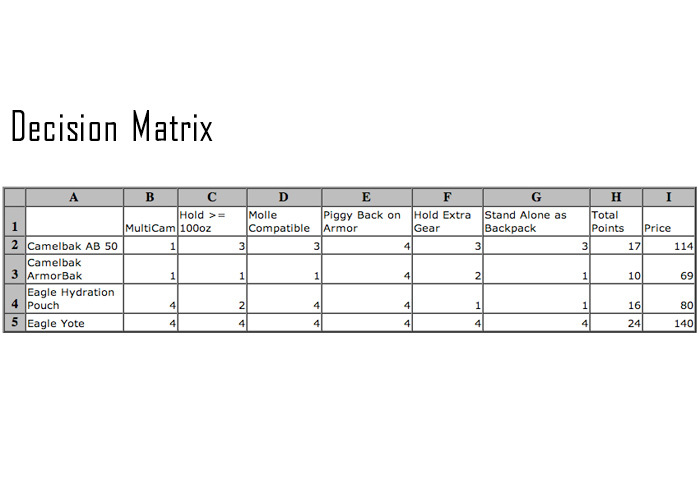 The decision matrix. List out all of the needs you previously defined in columns on the top. Next, list out all of the products in rows going down the left. The fun begins by ranking, numbering, or otherwise quantifying the ability of the researched products to meet the pre-defined needs. I like to use a score system that ranges from 1 through however many candidates/products I have. For instance, if you have 5 products it would range 1 to 5 and you would rank each product according to its ability to produce what you want. I give the good products higher numbers so I can simply tally points at the end and see the best candidates by which have the most points. If two or more products do equally well against a certain criteria then give them both the same score, just make sure this is an accurate decision. Don’t ignore cost completely in your decision so make sure to have a cost section in which you can place the actual dollar amount of the purchase (include shipping and taxes as applicable, again, accuracy is the key to making sound decisions here). When you’ve filled out your matrix you should have a clear understanding of what products will shine and which will fail. At this point if there isn’t a clear winner then list out the pros, cons, and ways to mitigate the cons of the top two products. When that’s done sit back and give it a common sense look over and, barring any bad gut feelings, make the purchase. One thing you always, always want to consider when choosing products is customer reviews. If you’re new to the manufacturer or the product this is imperative. Also review the site from which you plan to place your order. If Product ABC is $50 from a sells-it-all megasite but $60 from a small, focused, personable, and product/industry-specific site then consider supporting the smaller site (this is going to hit home again when I go into the aforementioned Care and Economy topic). www.DIYTactical.com and www.DIYTactical.com/forums: created by, and endowed with, custom nylon and tactical gearmakers, DIYTactical is a stronghold for information on tactical nylon gear that works. They are full information on what makes good gear good, can direct you on what products pass their standards, and even offer you avenues of custom and personal gear makers who make some of the best kit I’ve ever handled. 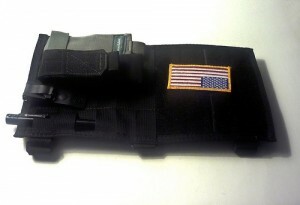 www.militarymorons.com: operated by a private individual, this straight-to-the-point website offers personal reviews on some of the most popular items in the tactical realm. Since the owner, much like Mr. ITS, does all of this at no charge to the masses, they don’t have the bankroll to do every tactical item in the world. So while the MultiCam Hanes boxer brief (not real) may not be reviewd yet, there’s still a large range of gear that is. Chock full of photos, militarymorons is a solid stop for your review needs. www.edcforums.com: EDC, or Every Day Carry as most readers will know, encompasses just what it says — the things you need and want every single day. The focus of the EDC community is to do it comfortably and covertly if at all possible — a goal all of us need to keep in mind in the civilian realm. The forum puts a lot of solid info out on items including query-based comparisons from the decently large forum base. Stop by, do a search, and if you like it sign up (just make sure to put a link to ITS in your sig, wink). Lastly, make sure you stop by industry-specific retail sites to scope out their pro reviews or customer reviews. Example, if you need some standard outdoor gear (think climbing kit, tents, stoves) you can try sites like www.rei.com and www.backcountry.com, each has a customer base that is quite large and often features a least a few reviews for products they sell. For more tactical products hit up www.skdtac.com, they focus on gear providers that are thoughtful about who they support, where they work, and the quality of their kit. I’ll be blunt: I don’t like crap. I don’t like people who steal others’ designs. I don’t like people who support subpar working conditions and wages. And, I don’t like people who eagerly take the money of those that put their lives at risk for their country all the while knowing they are selling these heroes crap. I have personal experience with the following and either personally endorse them or publicly scorn them. Keep in mind, though, that this is one person’s experience and your results may vary. TAD Gear (www.tadgear.com) – if you don’t know, find out. TAD (Triple Aught Designs) makes some of the best, most innovative, most functional clothing and items known to man. They are active in the wildlife support community and are serious about producing in America. ITS Tactical (www.itstactical.com) – if one group of people can say they research what goes into what they provide, it’s ITS. If you need help being convinced of this just check out their “blowout kits” https://www.itstactical.com/its-tactical-store/. 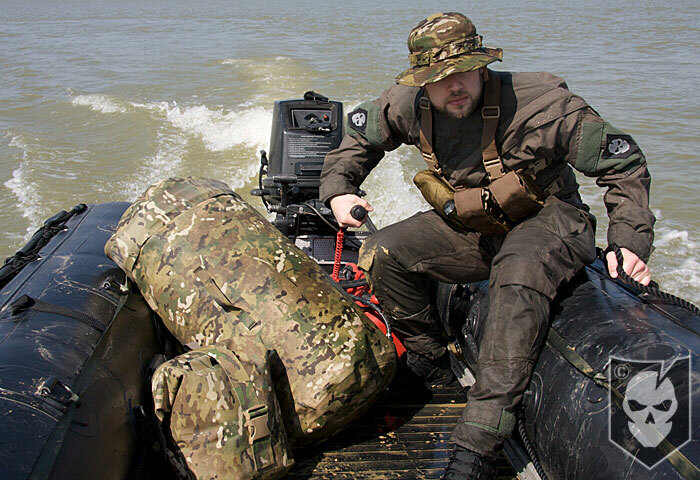 Fight and Flight Tactical (www.fightandflight.com) – between F&F, OC, and 215, you can’t get more innovative in tactical design and quality construction. These three have inspired numerous products that are continuously replicated by others. F&F has provided me with the two things I love most when it comes to smart operations — the Leader’s Armboard **link** and the Kneeboard **link**. And quality? I’d trust my life to them, time and again. OC Tactical (www.octactical.com) – See above. OC puts out quality kit that actually serves a purpose — functional and failproof. 215 Gear (www.215gearstore.com) – conveniently linked as one of ITS’ sponsors, 215 continues to lead the way in innovation. From GPS straps and accessories to life-saving retention lanyards, 215 puts stuff out that makes you think you just hit the life-saving easy button. SKD Tactical (www.skdtac.com) – SKDTac, as mentioned above, is a large retailer that refuses to offer subpar kit. If you end up buying from any of the numerous companies on their site you can be confident that you’re purchasing quality stuff from a trusted name. ADS Inc. (www.adsinc.com) – the world’s largest special operations distributor. They work with US companies (with a focus on Berry Amendment compliance) to provide good prices on quality gear. They are a large operation that can reach into many industries to provide for their consumer base. They, like SKDTac, only support quality gear makers with their large list of available brands. ITS Sponsors — If you trust the crew of ITS like I do, and like you should, then you should check out who they allow to be on their site. You’ll find sponsors displayed in tiled links on the right side of the ITS home page and you can check the “Links” tab for more trusted groups. Also, if you’re a Plank Owner or Crew Leader then you’ll notice a Vendor Discount Link in the welcome page that takes you to sponsor pages that provide you discounts on their kit — these discounts can easily cover your membership in one click of the “Submit Order” button (PS — a discounted ETA Kit is another such perk for Plank Owners and Crew Leaders… jackpot). www.condoroutdoor.com – disgust. Equate those two terms. Cheap kit, zero care about their customer base, and huge desire to copy the designs of companies that care about their customers is what you can expect from Condor. Add those ideas into your mental definition of Condor gear. While I’ve heard rumors that their gear is improving it doesn’t change their MO. If you have any of their stuff throw it out now and replace it. NOTE: Again, this is one man’s opinion and experience. Do not take this as libel, slander, or any other legal term that overly-litigious groups are eager to use. If you get one thing out of this article then get this. The companies that I listed as pro’s, and other companies that fall into the criteria I’ve used to list them as pro’s, are the exact companies that are going to make the American solider successful in the years (and hopefully decades) to come. This is true for your endeavors, too. They put money and thought into what they sell and make sure that they are giving back to the American economy and supporting solid labor practices. Every time you bypass their kit only to buy cheaper stuff two or three times over you sabotage what they so dearly inspire to do by employing Americans and offering fair prices against their wages and goods. Not only are you victimized by buying kit that will fail you, you’re supporting companies who steal the designs that these good groups put millions of dollars into creating, and you’re depriving American workers earning a decent wage the opportunity to provide you with quality kit from right here in the states. If you don’t understand the economic turmoil that we are very much still in then at least understand this — the companies that are stealing the designs and dollars of our in-country companies desire nothing more than to pillage the American economy and consumer for every last penny it can get. They are taking advantage of you buy offering you cheap junk at cheap junk prices produced by impoverished workers in sub-human working conditions. Stop them. Support the companies that are working hard to bring America back to the hard-working nation that every soldier is out their fighting for. I have a saying: buy quality, buy it fair and right, and be proud of what you bought. I know this is borderline patriotic propaganda but it’s the absolute truth. If you’re reading this then you know what it means to dedicate yourself to a greater cause, so expand on that and dedicate your gear-destined dollars too. One way to help make sure you get what you want is to buy smart; fill out the matrix as mentioned above and don’t hesitate to contact the manufacturer to talk about their product. I’ve talked to every single “Pro” above and was happy to end up buying from them, do the same (by the way, none of them push their products, they each speak objectively about what they can or can’t provide to meet your needs). I can assure you that you will be happier with your gear, proud to talk about your experience, and eager to recommend it to others when you heed the information in this article. So stop killing yourself and the American tactical industry — go buy some good gear. Editor’s Note: Please join us in welcoming Brock Carter as a contributor on ITS Tactical. Brock is a Engineer for the DOD and an avid shooter & outdoorsman.